Were you looking for the Wizard skill Archon rune effect Slow Time? 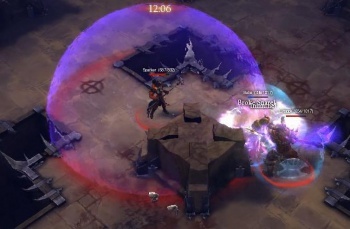 Slow Time is a Defensive Wizard skill unlocked at Level 16, creating a bubble where time flows slower for all enemies and their projectiles. This is one of the more powerful defensive skills in the game, and is very effective against monsters as well as other players in the Arena. All (almost) incoming projectiles are slowed nearly to a stop, as are enemy monsters, giving the Wizard time to devastate attackers as they come closer, or else run for it while the shield remains. Slow Time can be paired with Wave of Force to great effect, as all projectiles are reflected back to their source, and they will deal damage to any monsters they meet on the way. As of June 2012, shortly after release, one ability that is not slowed at all by this skill is the Elite modifier Mortar. Those flaming bombs pass right through the bubble unslowed, in what is assumed to be a bug. Slow Time is presumably one of the spells the Wizard learned from the Ancient Repositories of Caldeum where she was interrupted by Valthek. Messing with timespace is something not even the Vizjerei do any more, and is considered one of the most dangerous forms of magic. Refer to the Slow Time rune effects article for thorough descriptions of all five rune effects in this skill, including screenshots, videos, strategy tips, and other related information. Slow Time creates a bubble that surrounds the Wizard. Any enemies or enemy projectiles that enter the bubble are greatly slowed. The Wizard, her spell projectiles, and her allies are not affected by the slow time bubble, giving them a huge advantage over the greatly slowed enemies. The bubble remains where it was cast, persisting for several seconds, but the Wizard can move as soon as the spell is cast, though if she moves outside the bubble monsters may again target her without their shots or attacks being slowed. It's assumed that some boss monsters (and their projectiles?) will be immune to the slowing effect, but this is not yet known, and is subject to further balancing anyway. 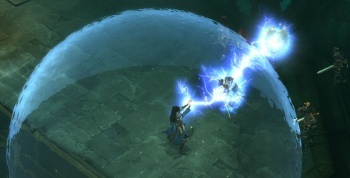 This spell has been used with Wave of Force to first slow enemy projectiles, and then throwing them back at the enemy. A video of Slow Time can be seen below, courtesy of the DiabloInc You Tube channel. Slow Time was first seen at BlizzCon 2008 when the Wizard was unveiled. It was updated ever so slightly in the demo shown at BlizzCon 2009, where it had moved down one tier in the Arcane Skill Tree, to Tier IV. One of the most useful skills in the Arena. Not just for the Wizard, but for the whole team. A Wizard who managed to cast one of these out in the center of the arena, where most of the early round action took place, gave her team a huge advantage. Enemy Barbs were nearly frozen in it, Mongrels were basically stuck there for the duration of the spell, and even other casters hated to be inconvenienced. It wasn’t as much on defense, since there weren’t many projectiles flying in the demo, but it was great to block movement. Skill tiers were removed for the July 2011 Press Event, allowing skills to unlock steadily from levels 1 to 30. Consequently, all skill levels were adjusted and Slow Time became a level 16 skill. Slow Time remained at level 16 when the beta started. With the Patch 13 changes, it was classified as a Defensive skill (but stayed at level 16). See the Wizard skill archive for more details on previous versions of Slow Time and other Wizard skills. Or see Slow Time (BlizzCon 2008) for the original version of this skill. Shooting Electrocute out of a Slow Time bubble. Disintegrate cast from within a time bubble. Distortion effect from the slow time field. This page was last edited on 16 April 2015, at 17:39.